The afternoon of 26 July didn’t go quite according to plan. 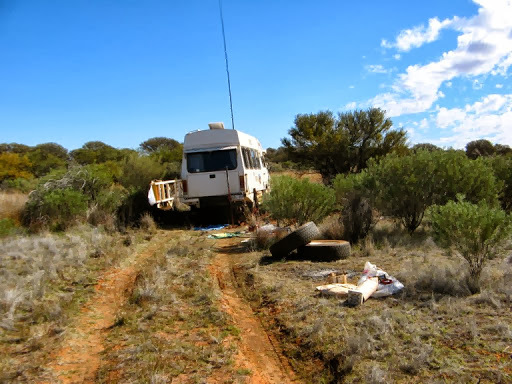 For a start it became cloudy, thus ruining our run of cloudless days, and then, close to Alexandra Spring on the Hunt Oil Road we met a diversion off the main track, which we learned later was to avoid a dangerous wash-away. 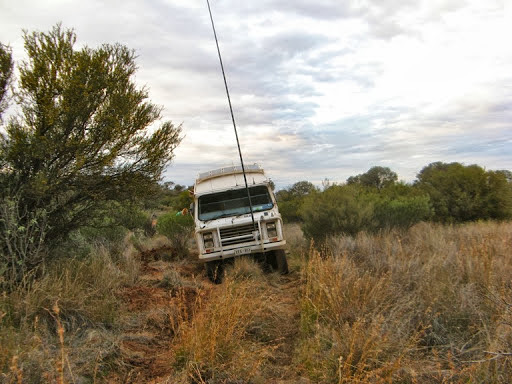 That diversion took us across a suspicious looking swampy area where a previous vehicle had become bogged. I took a look around and judged I could pass by that soft area a meter or so to the left. 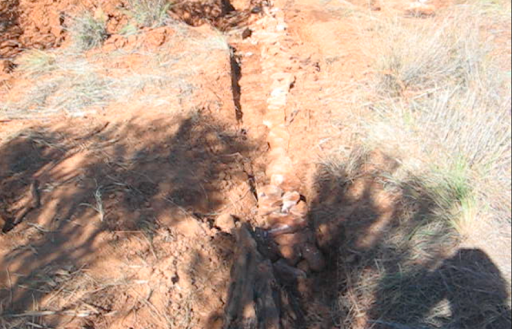 The problem we worked out later was that the water from the spring seeped under the soil making it wet from underneath while it looked firm and dry on the surface. The next 50m of track looked very much the same. 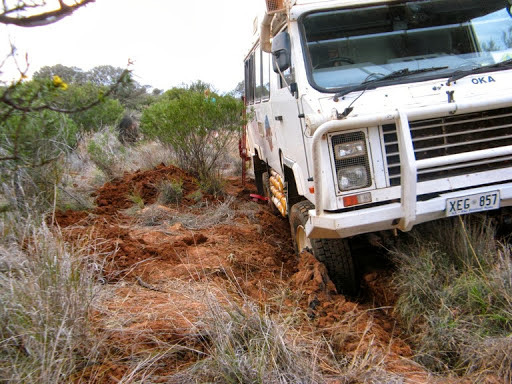 We might have been stuck be we still had good HF radio communications! It was getting late in the afternoon so we made an attempt to stabilise the Oka with the Hi Lift jack so it didn’t slip any further over night. That was difficult since the jack kept sinking into the soft surface but eventually with some large rocks we got some purchase and then retired for a strange slope-y dinner and sleeping arrangements. Hammocks would have been useful. Front diff on the ground. Rear diff very nearly on the ground. We had a slightly sleepless night, partly due to the angle of the bed and partly due to apprehension over how we were going to extricate ourselves from a difficult bogging situation, all by ourselves and a long way from help. 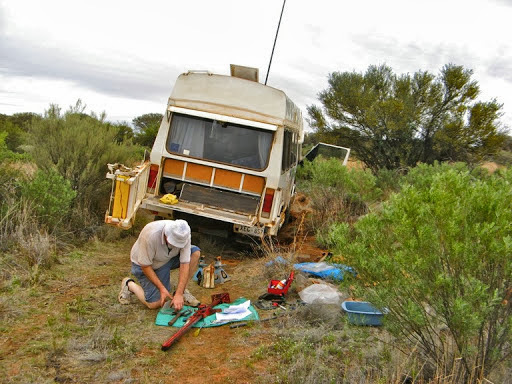 Our bogging site was in almost the dead centre of the Gibson Desert in WA and we had seen no one for 2 days. Considering our predicament we don’t look too concerned do we? Well that’s because things could have been worse. We had made contact with our HF radio so we weren't totally cut off. We had food and water for a couple of weeks so provisions weren’t a problem. 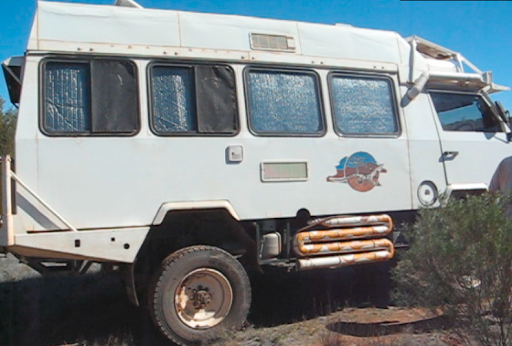 We plenty of spares and equipment and we’re fairly experienced with outback travel. Almost the perfect bogging environment you might think. We were up early for obvious reasons having mentally been through the all the options and plans we had available to us. It was very cool and cloudy that morning which was good for the hard labour that was before us, in fact we even had a shower of rain. The first thing we had to do was dig out the wheels to see the extent of the problem. 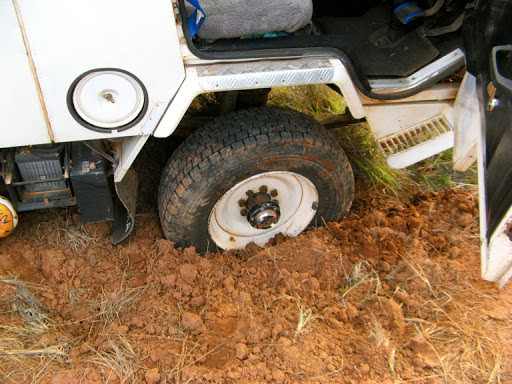 That meant shifting grass, shrubs and soft sandy soil to access the wheels. 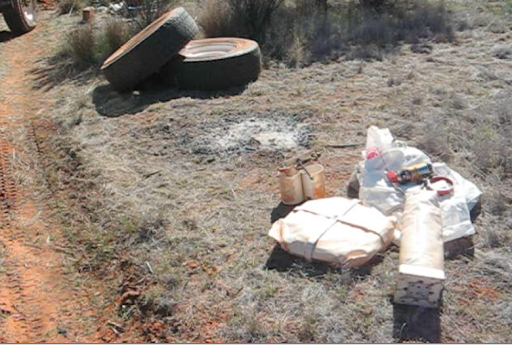 Next we had to establish a base camp, take out all the tools and equipment we would need, and lighten the Oka as much as possible by removing the spare wheels and heavy tools, and transfering the fuel from the rear to the left side tank. I always use fuel from the left side tank first for this very reason. The hi lift jack was also causing a problem in that it would raise up but not lower without difficulty so next I had to fix that. I’d overhauled the jack last year with replacement pins and springs but failed to notice some wear on some sloping edges which was preventing the release pins from sliding smoothly. I filed them smooth, reassembled the jack and greased the slides and that was all fixed. Before and after shots, all good now. 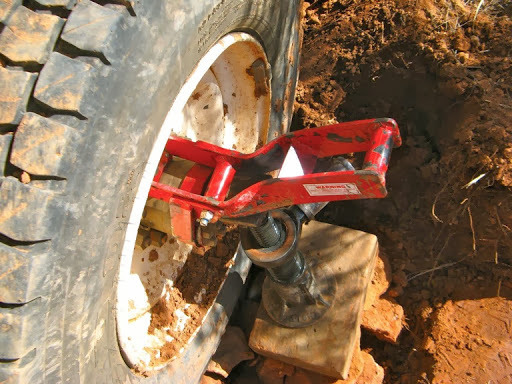 But the hub adaptor, which was supposed to enable us to lift a wheel directly using the hi lift jack, failed miserably and buckled under the weight of the Oka, so we had to use a different strategy. We alternately raised the rear of the oka with the hi lift jack and raised the wheel hub using a large screw jack on the unbuckled section of the adaptor. Using this process we eventually raised the wheel sufficiently to fill the void underneath. We also had to do the same with the front wheel. The biggest problem we had was stabilising the jacks which kept sinking into the mud. Eventually enough large rocks underneath provided a firm base to raise the Oka. 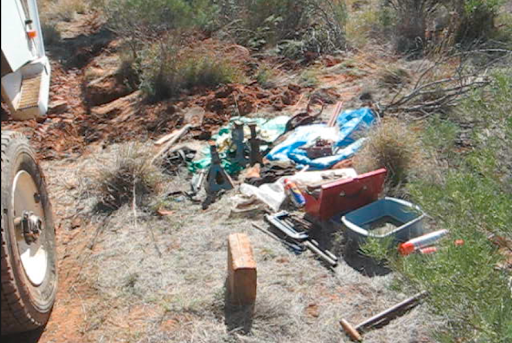 We had to dig out a ton of soft moist soil to get access to the wheels and carry what seemed like a ton of rocks in shopping bags 50m from a nearby creek bed to create a road way under the bogged wheels. We also had to fill the area between the wheels to carry the front wheel backwards without it sinking in again. But the Oka was eventually raised on to it’s new roadway sufficient for extraction. It took us round 8 hours of hard work, and we were physically knackered. It leans the other way now while on it’s jacks, which is good. Once the jacks were removed it came down almost level, ready to drive out. After tentatively backing off our home made pavement, the Oka was finally out of the bog and on firm ground again, nearly 24 hours after we got stuck. A long hard slog but we’d done it. Even the sun came out again. Janet showing off her newly built roadway. The front wheel did miss part of the the new roadway on the way back but that was only a quick job to construct anyway. Once out and after lunch (we suddenly realised we’d had nothing to eat all day), we now had to reinstall all this stuff. It was about this time that we heard the sound of an engine. Just our luck for someone to come along a couple of hours after we needed some help. A few minutes later 3, 4WD’s appear from in front of us. We waved them down to prevent them suffering the same fate as we had and they walked over to see what our problem was. They couldn’t understand how they got to be on the same diversion track as we were on, and reversed out to survey the area. 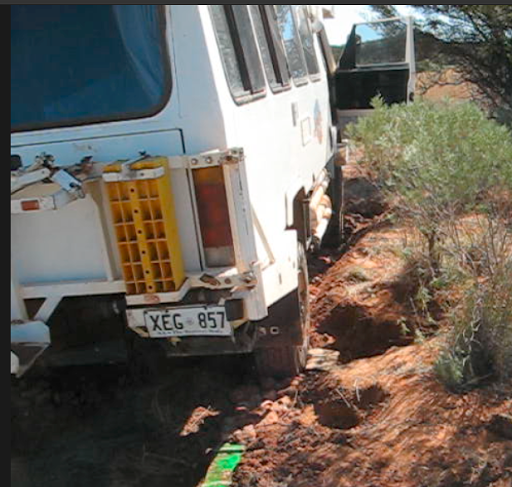 We maintained CB radio comms while they scouted around and located the main track about 100 m away from us to our left. It had a dangerous wash-away on it, which was the reason for our diversion. They carefully passed by the wash-away and came back up behind us this time, to render assistance and help us reload the spare wheels and heavy tools. They also surveyed a cross country route from where we were on firm ground to the main track beyond the wash-away and insisted on staying until we finished packing up and then guided us across the swampy and rocky ground to the main track. Then we were all OK and on our way again. Since we didn’t know the extent of the soft ground beyond us, without their help we would probably have turned around and backtracked 200km to find a more reliable track. 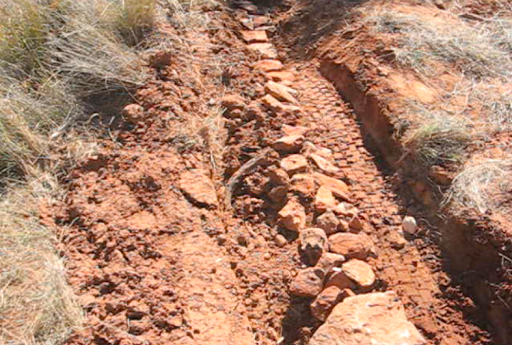 Now we had their knowledge of the track ahead, we were able to carry on and complete the track as planned to the Gunbarrel Highway. 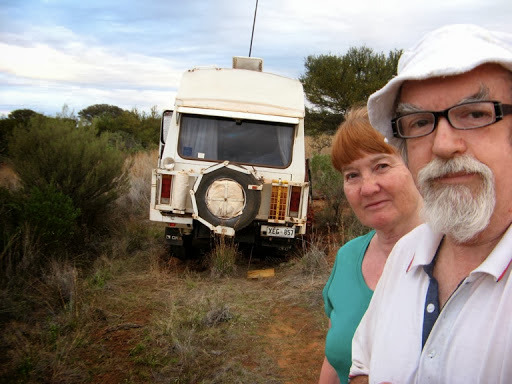 The 4wd’s were from Bendigo and were the only vehicles we saw on that track in 4 days. They had turned my poor judgement and bad luck into a successful trek. Just another outback adventure. 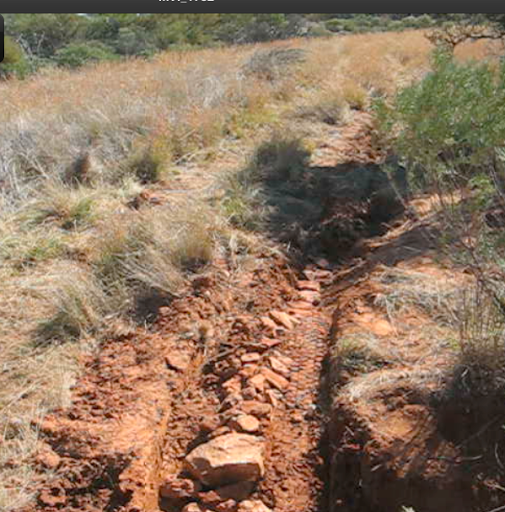 Looking back, we had successfully located the only soft section of track in 250km, but it was almost our undoing. 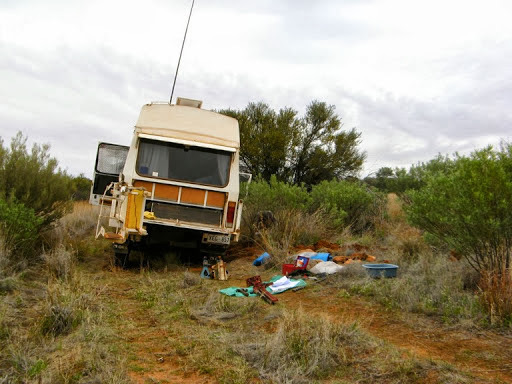 We were quite elated to have been able to extricate ourselves from probably the most serious situation an outback traveller could get into, and we had done it alone and with only the equipment and skills we carried with us. Experience and self-sufficiency planning had made the difference, but we also had our HF radio, and if necessary an EPIRB, had it been a worse situation. What else could we have done and what have we learned? While the Bendigo team was with us, we discussed the pros and cons of diff lockers and I made a throw away remark that if we’d had diff locks, we wouldn’t be holding this conversation. 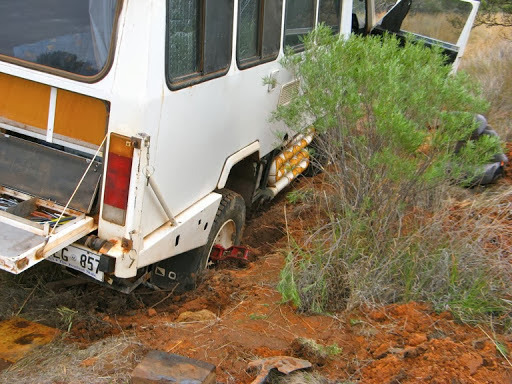 However, if we did have diff locks they would not have stopped us getting bogged in the first place, that was caused by a combination of an error of judgement and bad luck (a swamp in the middle of a desert? ), not inadequate equipment. And when bogged, most of the weight of the Oka was on the bogged wheels with much less weight on the other side wheels so they both spun. 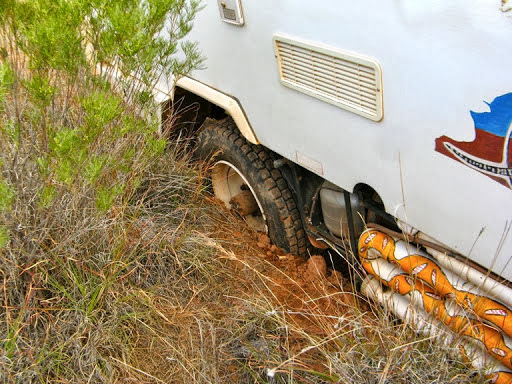 Even if they had been locked, the bogged wheels would have turned but would not have had the traction to crawl out of the depth of wet soil they were in. So while diff locks might have advantages in some situations, I don’t think they would have helped much in ours. Also if we’d had a winch, it would not have helped since there were no sturdy enough trees within 100m to attach a winch cable to. 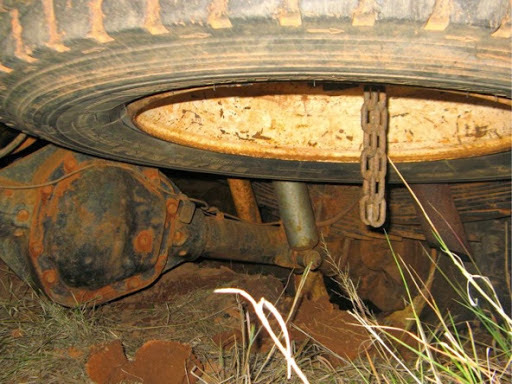 We could have buried a spare wheel as an anchor but as far as I know that has only ever been a theoretical idea to try, not a proven solution to the lack of trees, vehicles or other solid objects. Bigger sand mats might have helped but first we had to fill the void to raise the wheels to near ground level again. The rotating wheels just spat out anything we wedged under them since there was insufficient weight on them. We tried small sand mats, expanded aluminium, branches and rocks. All were spat out. So the remaining option is to travel with other vehicles for mutual support but that is not always possible or practical. We also learned that 2 powerful jacks with high lift are essential. 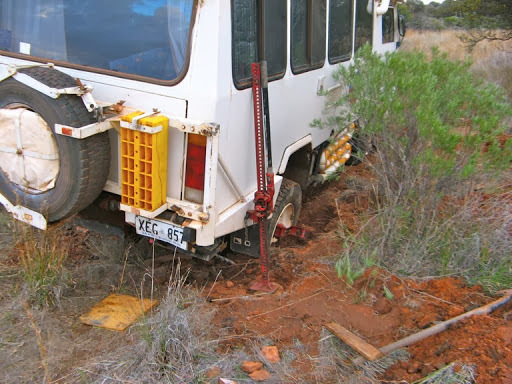 Neither of our jacks alone would have enabled us to raise the rear wheel high enough to pack rocks underneath it. The hi lift jack is operating at it’s extremes to lift the rear of a heavily laden Oka and takes a tremendous amount of effort to operate the lever then anyway. Our 3 tonne double acting screw jack works very well but has high minimum level to start with. Maybe an air powered hydraulic jack or a bellows type air jack would have taken some of the manual labour out of the process. 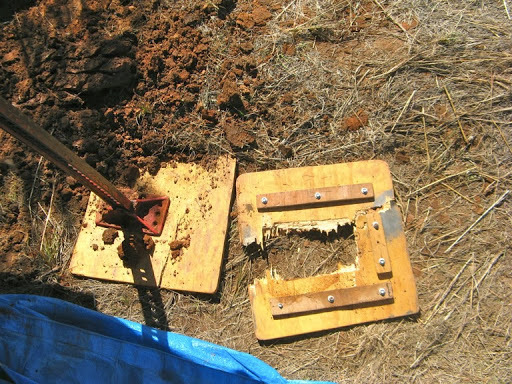 Large solid jack plates are needed for soft soil. Our plywood base plates didn’t last long but our 75mm thick lump of Jarrah worked well. The hub adaptor buckled under the weight of the Oka but it was still useful (almost essential) to raising the wheel. 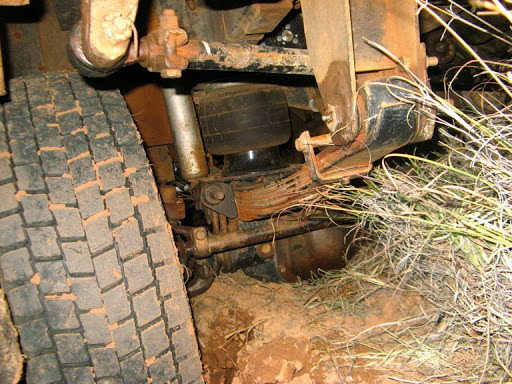 The alternative was to crawl under the unstable Oka and jack up the axle, which would have been difficult and dangerous due to the soft soil and height of the jack. I shall modify and strengthen the hub adaptor later for better functionality next time. Our Jarrah block worked well but is very thick. This is what we left behind as a reminder to the next visitor to not do the same thing. Following our debogging exercise, we carried on up the track about 40km and had an early camp, a celebratory beer, left-overs for dinner, and an early night to recoup our lost sleep (we slept about 10 hours straight). Thanks for sharing the recovery process and your thoughts afterwards.